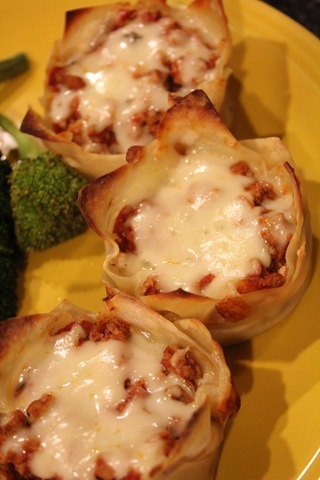 Last night’s dinner was Petite Lasagnas. I’ve had this recipe bookmarked for a while from Andrea’s blog and I am so glad I finally made it. 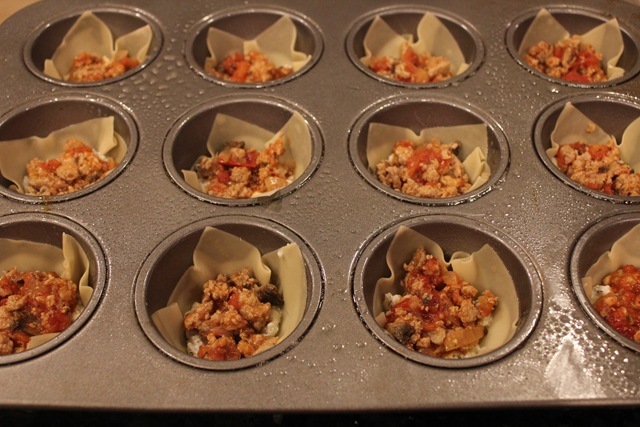 I love the cute little cups made of wonton squares, filled with ricotta cheese, tomato sauce and ground turkey. 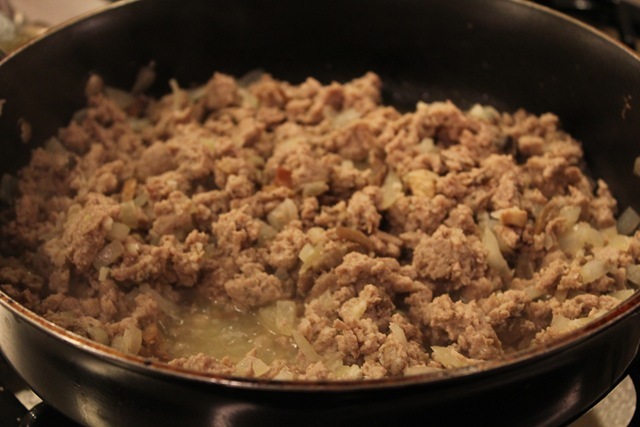 You can make the recipe as light as you want (less cheese and less meat mixture), or you can make it heavy by filling it up with all the ingredients. 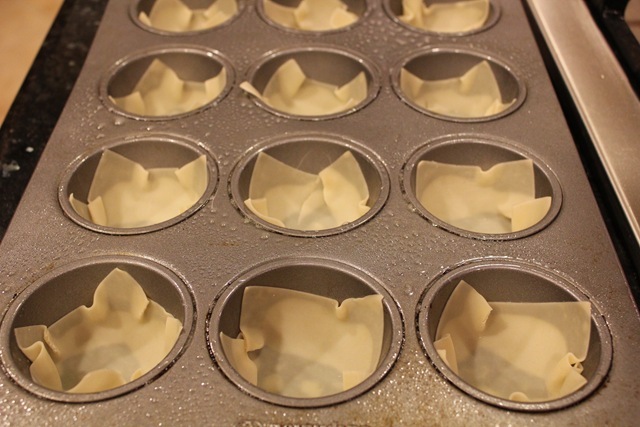 I also like that the raised edges of the wonton squares get crispy in the oven. It even gets more crispy when you heat up the leftovers in the toaster oven. I added Garlic Gold parmesan nuggets to the mix because I love that stuff. 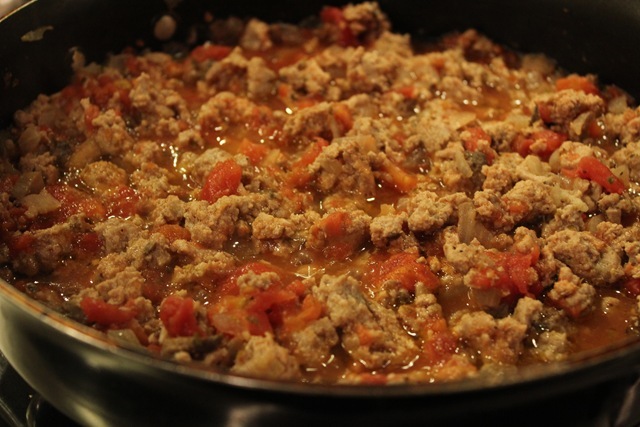 Add the crushed tomatoes, 2 tsp of oregano and 2 tsp of parmesan nuggets. Bring the pan to a gentle boil. Reduce the heat to low and simmer for 10 minutes. Remove from heat and set aside. (Notes: I would like to try making this vegetarian and using shredded tempeh next time I make it). 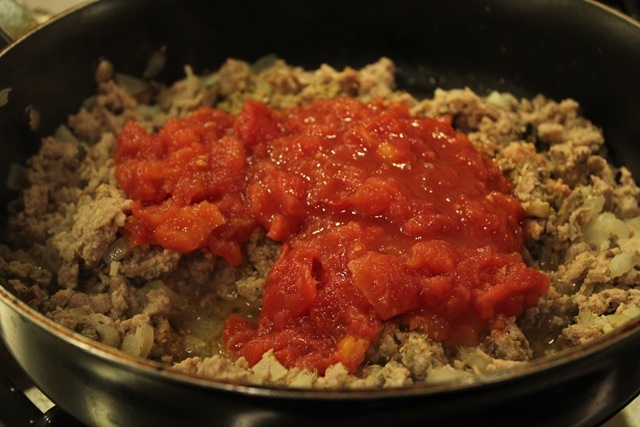 Preparing the turkey tomato sauce mix. 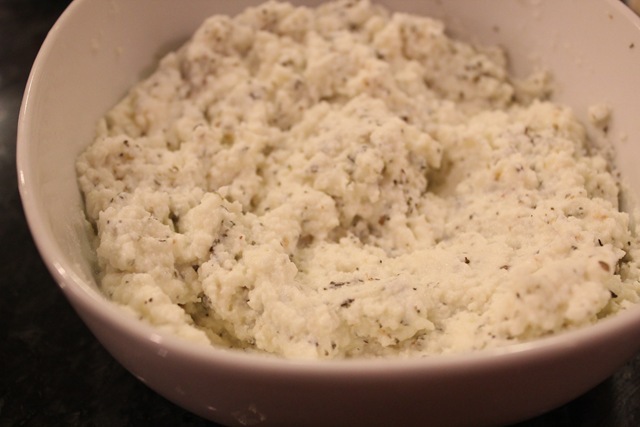 Mixing ricotta, a pinch of salt and pepper, teaspoon of oregano, and the basil. 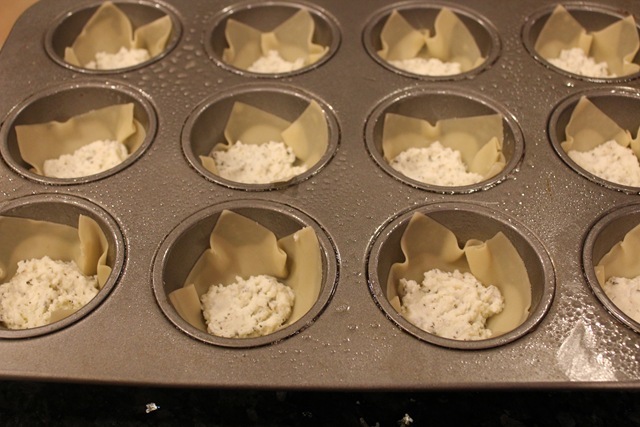 Be gentle laying down the wonton wrappers or they will tear. Third layer is the turkey and tomato sauce. Fourth layer is mozarella cheese. 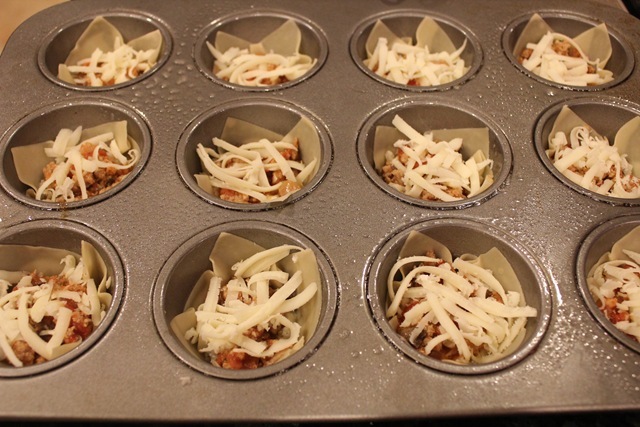 Filled muffin cups before going into the oven. Ooey gooey melted cheese when it’s done. (You can use less or more cheese, according to taste). 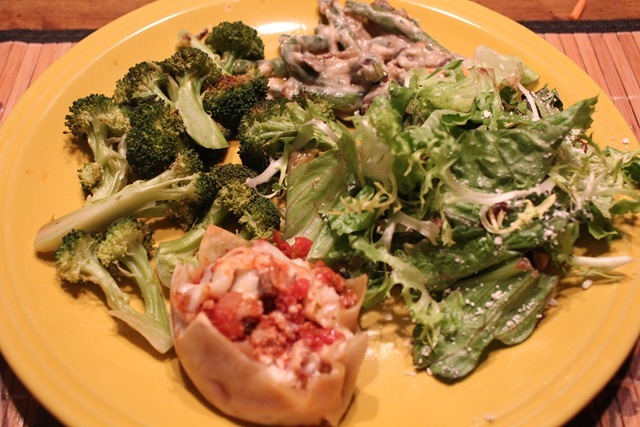 I served the lasagnas with a side of roasted vegetables and salad. YUM! 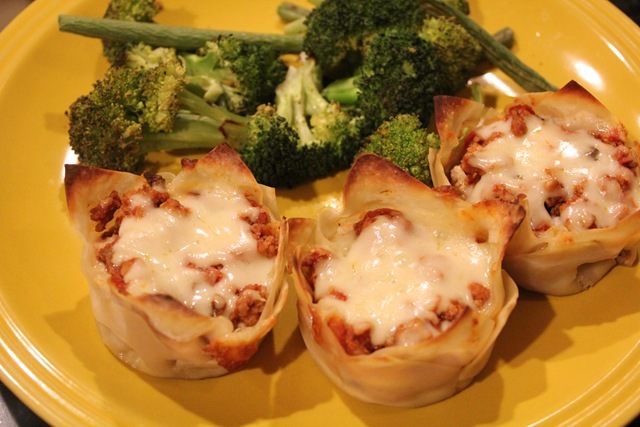 These look like the perfect little portions! Bookmarking so I can try it ! These are super adorable! They’d be great for a party! Love the idea of appetizer like dinners. 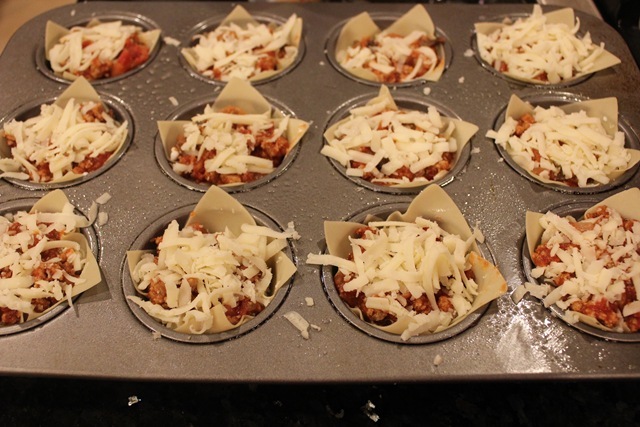 Ok Petite Lasagnas?? Cutest thing I’ve ever seen! I love that Idea!! I need to get meal planning too! I never do and am pretty good at putting meals together last minute, but I know planning my weekly meals would help a lot! 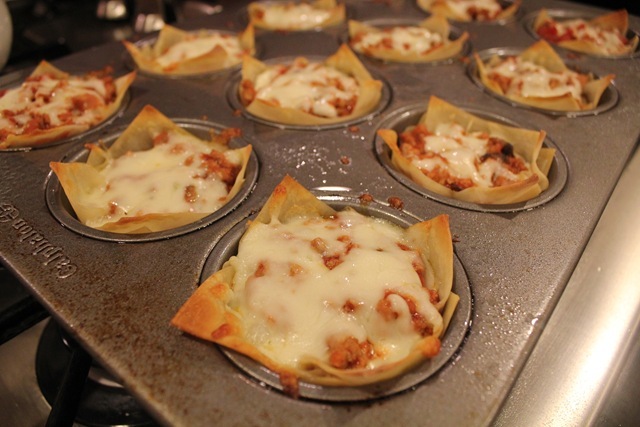 Since an entire tray of lasagna can be overwhelming this is the perfect solution! And even better, these look easy enough for someone like me. 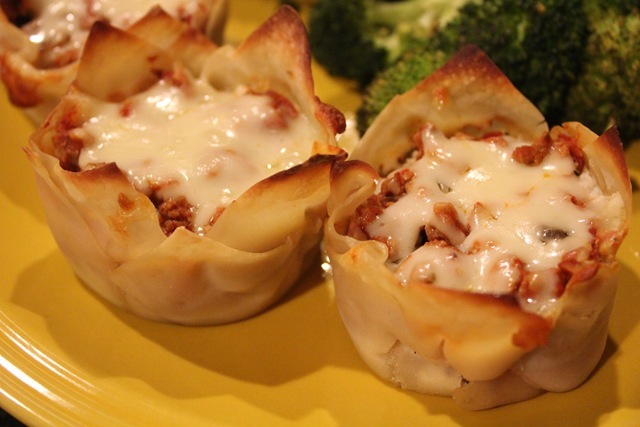 These little lasagna cups are so cute! I love them! I’m so bookingmarking this and making them soon! Perhaps when the inlaws arrive!!! I’ve been meaning to make these since I saw them on Andrea’s blog. Now I’m convinced that I need to make them!! I love the “single bite” idea! I met Andrea a few weeks ago at IFBC. She is a BEAUTIFUL person, inside and out. And now I’d like to devour this lasagna. mmm! can i haz some? lol! they look great! 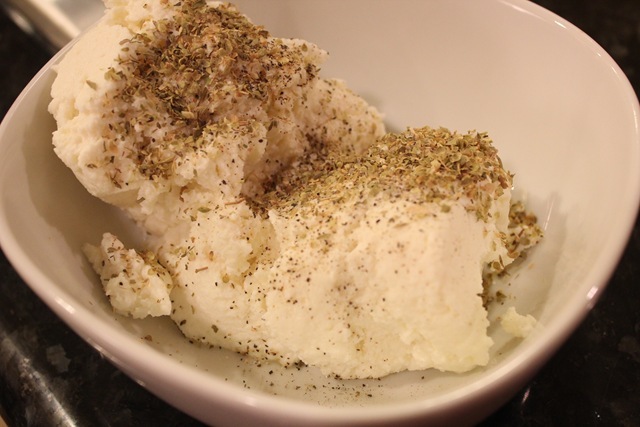 just shared the recipe with my online sista friends group ;D thanks!